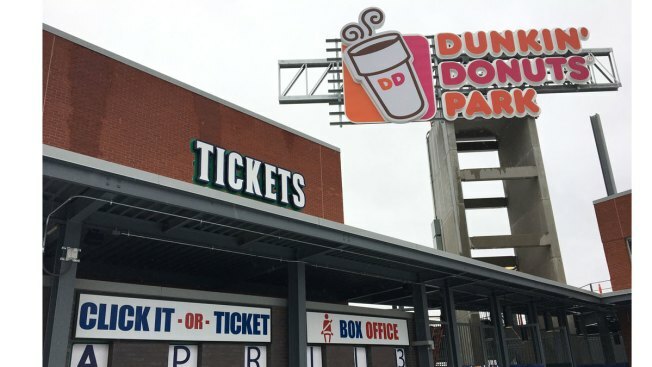 The UConn Huskies, University of Hartford Hawks and Central Connecticut State University Blue Devils will play at Dunkin' Donuts Park. Some college baseball players in Connecticut will have the chance to play at what Ballpark Digest ranks as one of the best minor league baseball parks in the country. For the third season in a row, Dunkin’ Donuts Park, home of the Hartford Yard Goats baseball team, will host college baseball teams. The three local Division I programs playing at the Hartford ballpark are the University of Connecticut Huskies, University of Hartford Hawks and Central Connecticut State University Blue Devils. The UConn vs Cincinnati game on April 5 will be the first game played at Dunkin’ Donuts Park this season, six days before the Yard Goats 2019 home opener on April 11. The tickets will go on sale at 9 a.m. Friday on the Yard Goats website over the phone (860-246-4628) or in person by visiting the Click It or Ticket Box Office at Dunkin’ Donuts Park. Tickets start at $10. Saturday, April 6: UConn Huskies vs. Cincinnati Bearcats at 2:05 p.m.
NEW DATE: Sunday, April 7: UConn Huskies vs. Cincinnati Bearcats at 12:05 p.m. --The game was postponed from April 5. Tickets for Friday, April 5 will be valid for Sunday, April 7. Wednesday, April 17, Hartford Hawks vs. University of Rhode Island Rams at 6:05 p.m.
Friday, May 3, UConn Huskies vs. Wichita State Shockers at 7:05 p.m.
Saturday, May 4, UConn Huskies vs. Wichita State Shockers at 2:05 p.m.
Tuesday, May 7, Hartford Hawks vs. CCSU Blue Devils at 10:35 a.m.
Tuesday, May 14, Hartford Hawks vs. LIU Brooklyn Blackbirds at 6:05 p.m.